New Minnesota Twins reliever Oliver Drake has pitched for five different MLB teams in 2018. We really hope Oliver Drake has been renting this season. He’s had to keep a suitcase packed all year. 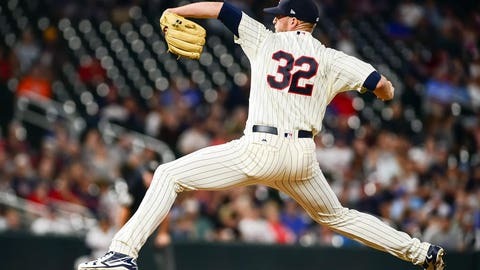 When the 31-year-old reliever suited up for the Minnesota Twins in the ninth inning of an 8-2 win Aug. 4, he made Major League Baseball history. Minnesota’s white throwback jersey with the pinstripes and cursive “Twins” across the chest was Drake’s fifth different uniform he’s worn in 2018. He’s the first player to play for five big-league organizations in the same season since Harry Wheeler in 1884. Wheeler was a pitcher, outfielder and first baseman who played 257 games from 1878-84. He suited up for five teams in 1884, playing for the St. Louis Browns of the American Association (a major league back then) and the Kansas City Cowboys, Chicago Browns, Pittsburgh Stogies and Baltimore Monumentals of the Union Association (the lone season of that league’s existence). Drake, unfortunately, has never pitched for a team dubbed the “Stogies,” but he’s toed the rubber for the Milwaukee Brewers, Cleveland Indians, Los Angeles Angels, Toronto Blue Jays and the Twins this season. Drake also tied a record for most American League teams played for in a season, four, which hadn’t been done in over 60 years. Pitcher Ted Gray last did it in 1955, hurling (briefly) for the White Sox, Indians, Yankees and Orioles. Outfielder Paul Lehner (Athletics, White Sox, Browns and Indians) did it four years earlier while outfielder Frank Hueslman (White Sox, Tigers, Browns, Senators) was the first to, uh, accomplish the feat back in 1904. Previously eight players in the modern era had appeared for four major-league teams; the last to do it was Oswaldo Arcia in 2016, with the Twins being one of his stops. The others were Willis Hudlin (1940), Mike Kilkenny (1972), Wes Covington (1961), Dave Kingman (1977), Dave Martinez (2000), Dan Miceli (2003) and Jose Bautista (2004). In addition, in 1884, George Strief played for four teams (but he probably got lost in the shadow of Wheeler). Drake has spent most of his 2018 campaign with Milwaukee, recording 12 2/3 innings of work for the Brewers. His numbers don’t exactly pop off the charts — a 7.31 ERA in 28 1/3 innings — but his career 9.9 K/9 shows promise out of the bullpen, which is why 17 percent of the league has requested his services in 2018. Selected in the 43rd round by Baltimore out of the U.S. Naval Academy in 2008, Drake pitched his way through the minor leagues for eight seasons before making his MLB debut for the Orioles in 2015. He appeared in 30 games for Baltimore from 2015-17 before being sent to Milwaukee in exchange for cash April 14, 2017. That was the first of many transactions in his years ahead. With six teams on his MLB resume, Drake still has some work to do if he’s going to match fellow pitchers Octavio Dotel and Edwin Jackson for the most teams played for all-time: 13.